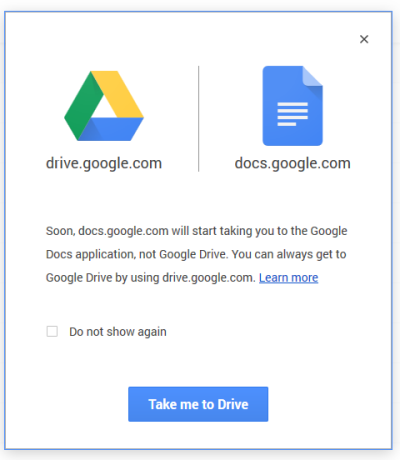 If you go to docs.google.com, you might see this message: "Soon, docs.google.com will start taking you to the Google Docs application, not Google Drive. You can always get to Google Drive by using drive.google.com." Until now, docs.google.com redirected to drive.google.com without displaying this message. "You may be using docs.google.com to access Google Drive. With the launch of the new Google Docs editors home screens, docs.google.com will redirect to the Docs home screen, where you'll find all of your Google Docs and Word files," explains Google.